Small Clear Star Hanging Light Fixture - 12" Dia. 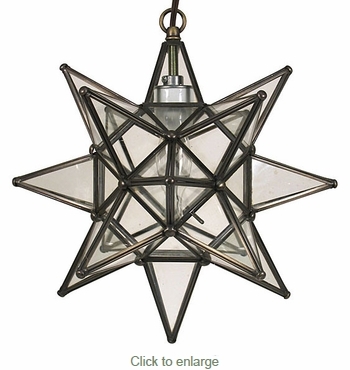 This small clear glass star light will complement any style decor and enchant all who enter your home. These hanging star lamps are all handmade by talented craftsmen in Mexico. A Mexican glass star lantern is the perfect lighting accent for Tuscan, Spanish colonial, southwest, or Santa Fe style decor.